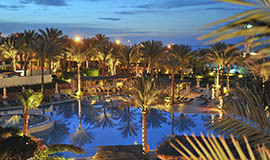 Sharm El Sheikh is a memorable retreat at the Red Sea, standing as one of the world’s premier destinations. 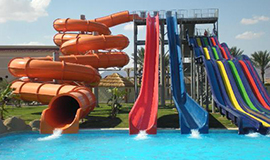 It enjoys year around sunshine and boasts an array of attractions catering to different travelers. 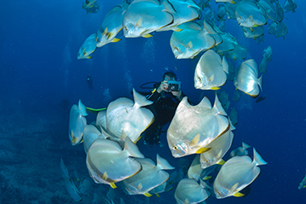 The city is renowned for housing one of the world’s best diving sites . 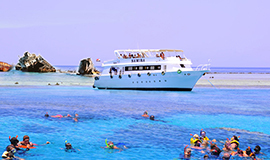 The dazzling diversity of corals and aquatic species offer a picturesque adventure over the surface and through the depths of the Red Sea. 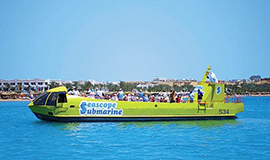 For those who enjoy watching the splendid marine life of the Red Sea without being involved in any diving or snorkeling activities, there are scheduled submarine or glass boat trips that could be arranged. 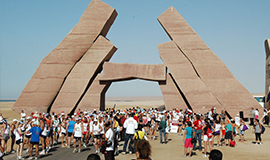 For the more adventurous travelers, mountain climbing is an intriguing experience in Sharm El Sheikh, given its mountain landscape. 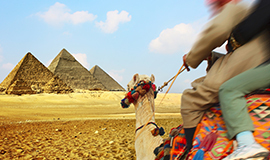 Apart from aquatic activities, you can take a camel trek into the desert to visit Bedouin villages, mystical oases, or the mangrove forests of Nabq . Or you can stay in town, and enjoy the most exotic culinary experience at one of its world class international restaurants. 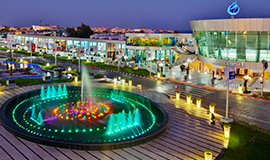 After your trip to Sharm El Sheikh comes to an end, stop at its various shopping outlets to bring a souvenir for your loved ones. 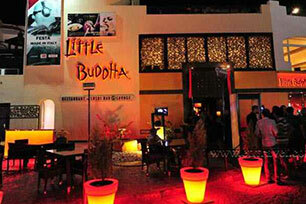 Shops offer beautiful handicrafts and other magnificent options to choose form. 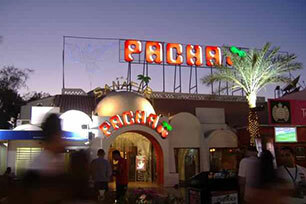 There is more to Sharm El-Sheikh than beaches, sea and shopping of course. 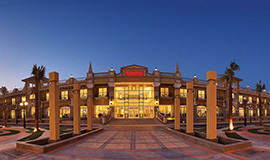 It’s a well developed area that feels “European” with refined hotels, facilities and amenities. 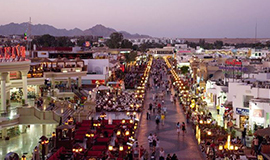 Sharm el Sheikh has a fantastic range of restaurants, bars and cafes to visit as well as the hotels own all inclusive menus. 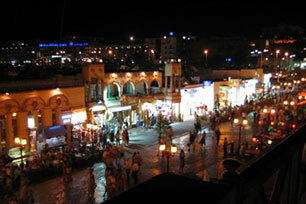 The market area in Old Sharm is popular for its abundance of seafood restaurants and cheap prices. 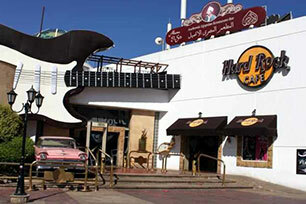 The Il Mercato promenade, often called “Les Champs Elysee” of Sinai close to the Iberotel IL Mercato Hotel offers a varied selection of excellent cafes and restaurants. 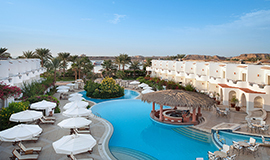 Jaz Mirabel Beach offers stunning views of the Red Sea in a luxurious but relaxed family-friendly setting for the perfect Egypt holidays package. 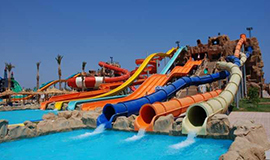 Jaz Mirabel Park is located in the charming and secluded Nabq Bay, a ten minute drive from Sharm El-Sheikh International Airport. 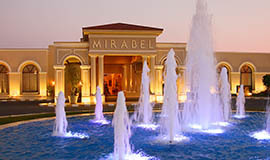 Jaz Mirabel Club, located in the secluded Nabq Bay less than ten-minutes from Sharm El-Sheikh International Airport, is part of the larger Mirabel Resort Complex. 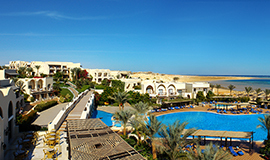 Jaz Belvedere has direct and exclusive access to Montaza Beach in Sharm El- Sheikh, making this five-star resort the ideal place for your luxury holiday in Egypt. 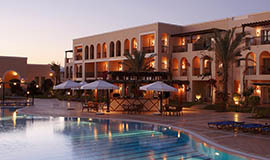 Iberotel Palace is the premium luxury Egypt holiday resort destination in Sharm El Sheikh. 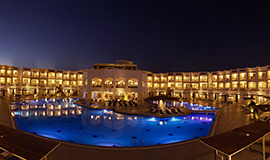 Iberotel Palace is also first choice on the Red Sea coast for conferences, incentive trips, romantic getaways or honeymoons in Egypt. 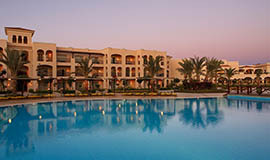 Sol Y Mar Sharks Bay is one of the latest additions to the Jaz Hotels & Resorts portfolio, opened November 2009. 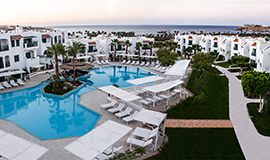 Jaz Fanara Residence is located on the cliff of Ras Om El Sid with a breathtaking view of the Red Sea and the national park of Ras Mohamed and only minutes away from Neama Bay. Boat trip to Ras M..
VIP Cruise to Ras .. 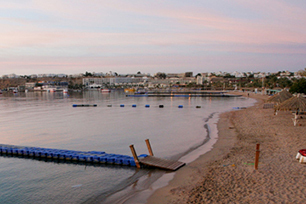 When the sun sets, Naama Bay is the place to be. 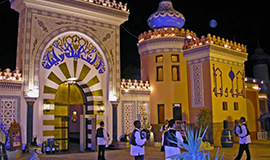 It is the heart of Sharm El Sheikh’s nightlife and the core of its entertainment, with an endless number of bars, restaurants, and cafes. 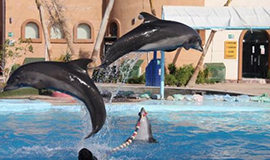 It is a fully developed town that incorporates private beaches, hotels, casinos, bazaars, and other amenities that formulate its vitality, positioning it as Sharm’s center of attractions and activities. 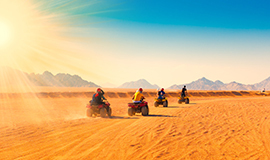 Situated around 35 km / 22 miles north-east of Sharm El Sheikh, Nabq is an important coastal protectorate and is sandwiched between the resort of Dahab and the Strait of Tiran. Amongst the attractions in Nabq, the rather surprising mangrove forest stands out as a highlight, with its eye-catching root systems dominating many areas of the coastline and offering an important natural habitat for local wildlife. 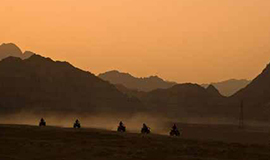 Other interesting sites in Nabq are the visitors centre, a number of hiking trails, areas where camping is permitted, and some underwater scenery best enjoyed when snorkeling. This site is a coral shelf that starts near the shores and slopes down quietly with many sandy patches, pinnacles, and coral heads in between. 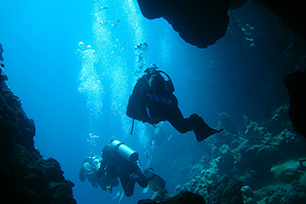 It is renowned for its large gorgonian forest in the south starting at 17 meters and going deeper than one could see. The plateau is teaming with marine life, corals, and even whale sharks and mantas. There is a huge possibility to encounter pelagic creatures such as tuna, trevally, carnax, and grunts. 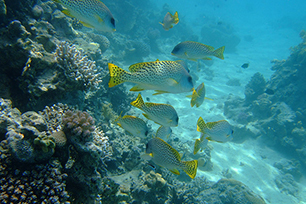 You may also find Crocodile fish, all kinds of morays, and surgeon fish swimming around the plateau. 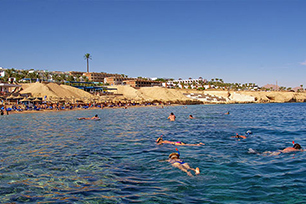 Sharks Bay is situated to the North of Naama Bay. This amazing bay consists of a rocky yet pristine shoreline where a deep sandy canyon drops rapidly through the reef to an approximate depth of more than 60 meters. It is rich with soft coral reefs and a wide array of marine species including barracudas, spotted eagle rays, and sharks, after which the bay was named. 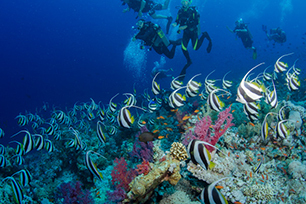 To the south, the reef has a moderate slope coated with corals, whereas to the north it is a shallow area that suits the purpose of light snorkeling. 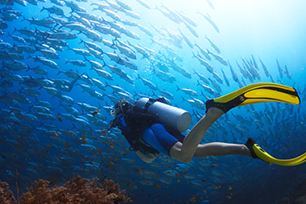 The average depth of Sharks Bay ranges from 98 to 280 meters, which therefore requires advanced divers to be able to enjoy diving and snorkeling through numerous sites at the bay. 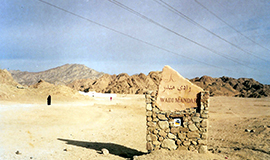 Named after Tiran Island, the Straits of Tiran are the narrow sea passages, about 13 wide, between Sinai and the Arabian peninsulas which separate the Gulf of Aqaba from the Red Sea. There are seven water- bird species that are known to breed on Tiran Island, as well as four reefs that occupy the center of the Strait including Gordon, Thomas, Woodhouse, and Jackson. 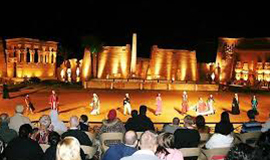 All are among the most stunning and best-preserved in the entire Sharm. Fauna is extremely abundant here and tends to be pelagic. This site is covered with coral towers, pinnacles, and is one of the favorite playgrounds for turtles. 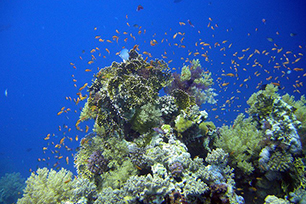 It houses magnificent soft coral gardens, huge pieces of salad coral and an extremely wide variety of marine life. Beneath the towering cliffs that continue below the surface to disappear into the deep abyss the wall is covered with soft coral and honeycombed with numerous gullies and canyons that are home to hoards of glass fish and hatchet fish herded by red mouth grouper. An overhang, fringed with sea fans at 10 meters, is a great place to watch the Trevallies, Jacks and Turtles passing in the blue. At the southern end Anemone city is worth a visit. 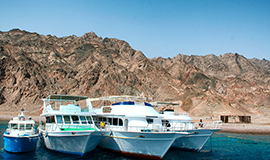 Jackson Reef is a very popular one, located on the northern most of the four reefs that separates the Sinai with Saudi Arabia. The strong currents, often from the North, that are created here in the small opening make sure large pelagic, sharks and other big fish are seen here frequently. This reef is fully covered in beautiful soft and hard coral, and you will see barracudas, jacks, hammerheads and tiger sharks. 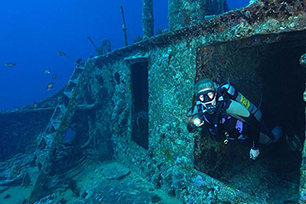 Here at depths of 45 meters plus lie the remains of the mysterious Lara wreck, which was a Cypriot merchant ship that collided with the reef in 1981. 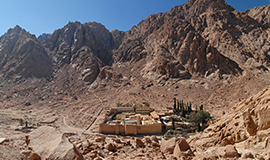 Situated right at the tip of the Sinai this site is world renowned, the two small ergs are joined by a vertical wall dropping into the abyss. Start your dive at Shark reef and use the prevailing current to explore the wall abounding in multihued soft corals. At 30 meters large schools of barracuda and snappers gather in often-strong currents just off the wall. Swim through the schools to the outside as silky sharks usually gather there, but be careful not to lose your orientation to the wall. As you proceed toward Yolanda you will reach a plateau at 15-25 meters scattered with small ergs and coral outcrops where stone fish and scorpion fish wait for a meal. Continuing round the reef you will come upon the scattered remains of the wreck of the 'Yolanda' complete with its cargo of toilets and baths. The whole of this area is big fish territory so keep an eye on the blue for the action with tuna, bluefish, and the occasional hammerhead. 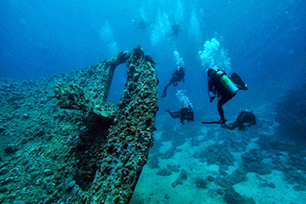 With its historical cargo of World War II machinery and equipment, all neatly stowed in its open holds, the Thistlegorm would be a diving highlight anywhere in the world, not just in Sharm El Sheikh. 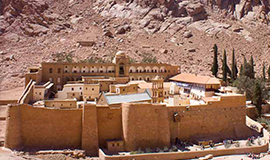 This most famous of Sinai Peninsula dives has to be experienced to truly appreciate its wonders. Discovered in 1977, the "Dunraven" was an 80 meter steam and sail powered vessel with an iron hull and wooden decks. It is almost completely upside down, and lies diagonal to the reef. Her bow at 18 meters is the shallowest part, and the stern is at a depth of 28 meters. A good route to dive the "Dunraven" starts at the bow. Follow the keel to the rudder and screw and go down to the ground, around the stern. Close to it on the starboard side is a big crack that allows it to dive into the hull. 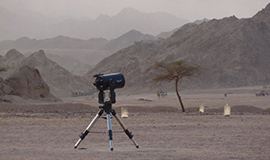 There is enough light coming through the holes, but it's useful to carry a lamp to explore the debris on the ground and the remains of the machinery. The inner compartments have disintegrated long ago, so the inside looks very much like a cave. The exit goes over the two boilers through a second big hole. There are different dive plans for this reef starting at the boat mooring point in the south. To the southwest is a shark amphitheatre, or more often called the bowl, as it represents a large circular bowl to 24 meters of depth and sharks may be spotted sleeping on the sand. You can also go eastward to a drop-off that starts in 16 meters of depth and which is covered in soft corals and gorgonians. 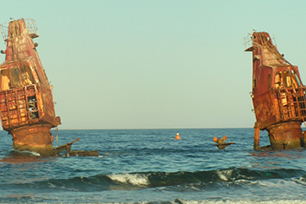 There is the wreck the Lovilla or Lullia which ran into the north of Gordon reef in September 1981. This commercial freighter is easily seen from far away as it stands out more than 10 meters above the sea. Divers are actually waiting for this ship to collapse as it is not safe now to explore its interior areas. 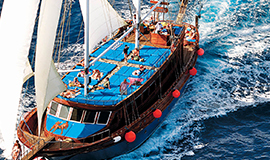 Ras Katy is a shallow dive site, ideal for lunchtime and training dives. 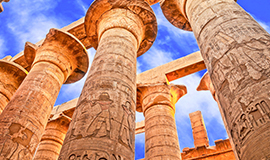 It’s located at a few hundred meters west of the Temple, and contains several coral pinnacles between 5 and 18 meters of height. 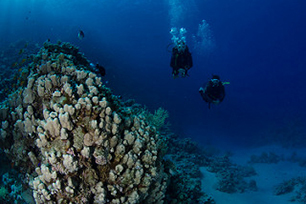 Some of them contain parts of broccoli coral, while others are covered in soft white corals and its inhabitants. There are some caves and crevices which contain many lion fish and glass fish. 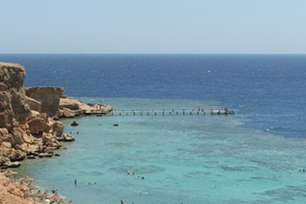 Situated at the southern entrance of the large bay Marsa Bareika, this dive combines a vertical wall, impressive chimneys and blue water. 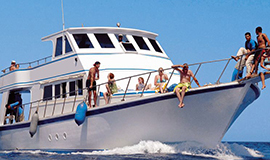 This is a good place to find large tuna, barracudas and in summer, cruising grey reef sharks. 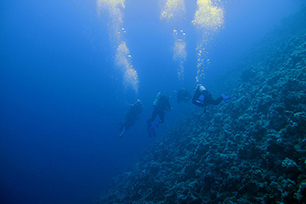 Make your decompression stops among the gullies and soft corals with a view into the blue. This is a group of coral heads in a row coming up from a depth of 12-20 meters if viewed in the right position and using your imagination they look like columns of a temple. 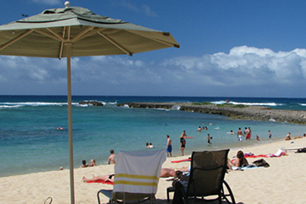 On the in shore side there are sandy patches at about 8 meters with loads of inlets into the shore reefs. The coral heads themselves are about 2 meters apart allowing you to swim between them and a couple of them have swim through routes. ne of the main features of this dive site is the canyon which starts in an inlet in the shore reef at a depth of around 8m. 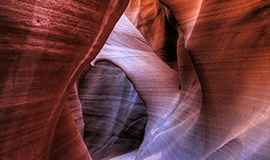 There is either the main entrance or a little swim through to the canyon. For those that are qualified there is a cave on the right hand side at 18 meters but lights and line are required as the bottom can get stirred up.